Video Still 1, 3:11 min. "Unnamed World: Habitats" navigates questions about hybridity and identity in the face of the market and popular culture. My central question probes into our visual reliance on objects to tell a story. This series of work utilizes the construction of irreverent museum environments; sets, props, actors and lighting framed into vignettes where the complexities of the museum as a site of cultural tourism take place. 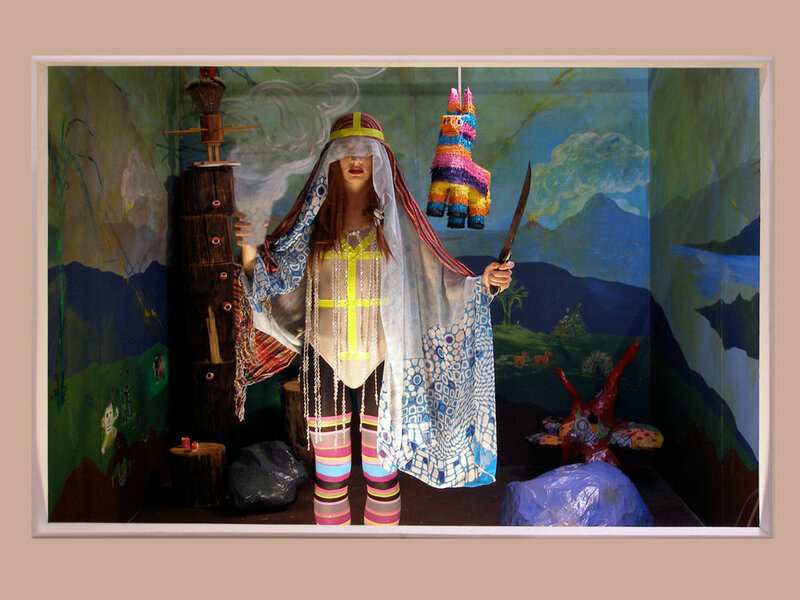 Multiple projects interconnect and overlap here: 1) short videos of imagined characters interacting with the space, 2) artifacts harvested for “anthropological” display, 3) digital collages that play with imagination and fantasy. 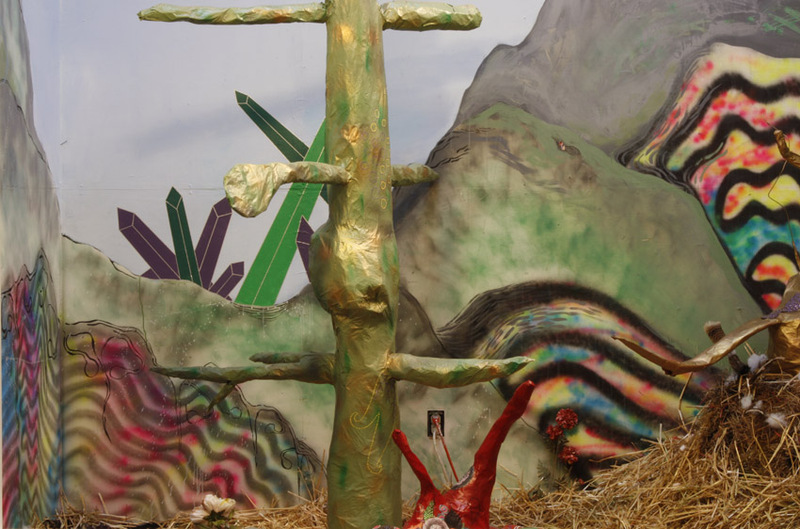 Particular couplings are present in all of these manifestations: handmade objects crafted with mass produced materials, dramatic nature scenes and alien creatures, bizarre characters performing inexplicable activities. I am using the museum as a site of critique but also a place for fabrication of new stories and characters that might inhabit a diorama at an intergalactic Natural History Museum. Questioning the role of the authentic maker in a museum setting, I will be delving into current constructions of “native” and “invader”. My studio practice over the last few months has been comprised of re-making diorama scenes, photographing the work and making videos with imagined characters. I am sticking closely to the themes of authenticity, craft/materiality, and value (monetary and cultural). In the video series, I have created four characters: 1) the vendor 2) the wrestler 3) the curator and 4) the storyteller. Each represent one aspect in the life cycle of a crafted object, and in each video the mood and attitude reflects those changes. The vendor dances pirouettes with his objects ready to sell to the next person who says “maybe”. The wrestlers put on a “collector’s fantasy” show, revealing alluring dance moves and encouraging the viewer to “Hurry Up and Buy!” The curator and the storyteller may appear to have similar roles, but one is decidedly more prone to exaggeration than the other. In the storyteller video, presents a slow monotone voice detailing a fantastical explanation of alebrijes. This is a cut up version sampled from various Internet retail sources. 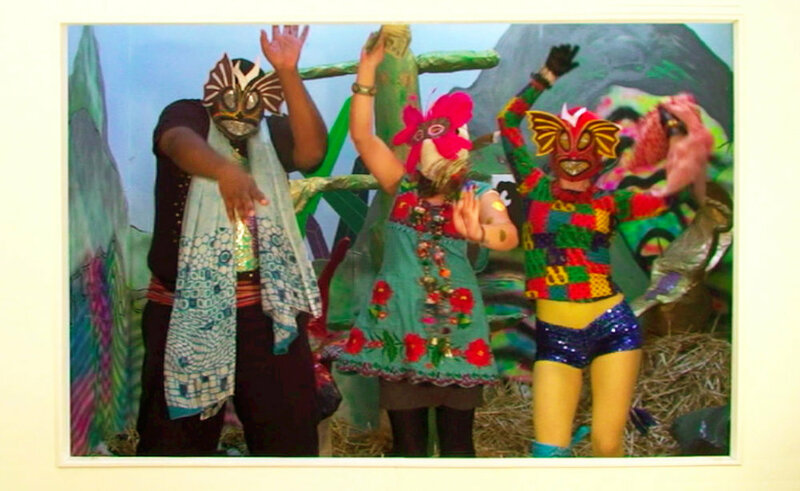 The storyteller video also integrates images of the popular wrestler named Alebrije and his small side-kick, Cuije – juxtaposing pop culture against the “ethnic craft”. For my final MFA show, “Unnamed World: Habitats”, I have created a life-size diorama installation, which explores the interior of the modern bourgeoisie home – envisioning the intimate living quarters as a display for exotic exploits and cultural discoveries. The hand-painted wall painting is a contemporary take on the visually stunning panoramic wallpaper, “Les Sauvages de la Mer Pacifique”. The wallpaper was manufactured in the French town of Mâcon during the early 19th century and was inspired by voyages to the Pacific by explorers such as Jean François Galaup de la Pérouse and James Cook. The panoramic view surrounds the viewer with “the vision of distant and exotic lands… depicting people from diverse places, all unified within a lush landscape”. Inside the house is an installation of invented postcards from “far-away” and exotic places, as well as a collection of memorabilia. On these walls, palm trees grow side by side with Christmas and cherry blossom trees, while favelas from Rio are nestled next to a car jumping across the Grand Canyon. Here time and space is compressed into a flowing panorama of excitement.